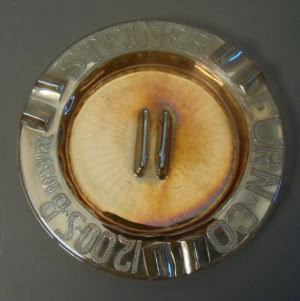 Pattern Description: Advertising ashtray with the company name, address and either Mens Wear or Furniture. Letters are all capitals and stippled, the base is rayed, there is a match holder in the center and 3 cigar/cigarette indentations on the edge. 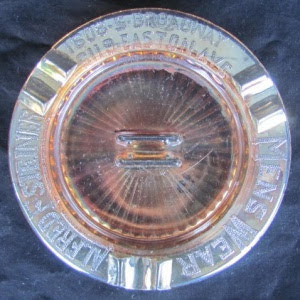 This advertising piece for a St. Louis, Missouri company is currently known only in round marigold ashtrays that are probably from approximately 1935-1940. 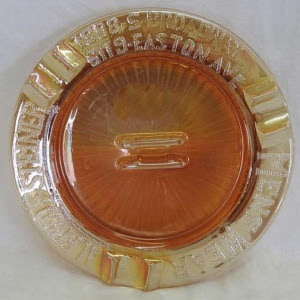 The lettering around the edge is divided into 3 sections (separated by cigar/cigarette holder indentations on the edge)and contains the company name, the company address, and the product being advertised (Mens Wear or Furniture). In the middle is a holder for a small box of wooden matches. 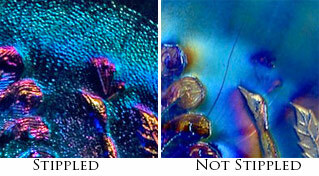 The bottom has a rayed pattern. 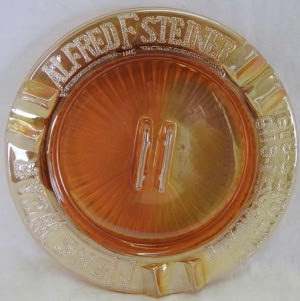 A similar shape would be the Polo ashtray.